Vancouver, BC (April 19, 2017) – Held yesterday at the Sheraton Wall Centre, Vancouver Magazine announced the results of their revered 2017 Annual Restaurant Awards. 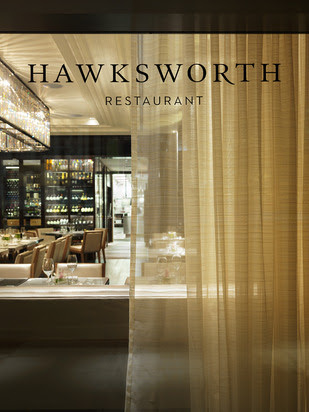 Hawksworth Restaurant is honoured to have received Gold in the category of ‘Best Upscale Dining’ for the 6th consecutive year. “[Hawksworth] continues to perfect a mélange of imaginative food, an amazing wine list and note-perfect service that make it the obvious choice when the occasion – be it a 50th wedding anniversary or an impromptu Tuesday night – demands that everything be just so,” explains Vancouver Magazine. Among excellent company, such as CinCin, Cioppino’s and The Pear Tree, this accolade speaks to the restaurant’s ongoing commitment to exceptional cuisine, service and an unparalleled dining atmosphere in Vancouver. This year also marks the first year with Chef Chris Stewart at the helm of the Hawksworth kitchen as Chef de Cuisine and has since become an essential member to the hardworking and dedicated team. Also to thank are Pastry Chef, Wayne Kozinko and Director of Operations, Chad Clark, both of whom have been integral supports since the restaurant’s opening in 2011. Hawksworth Restaurant would like to congratulate all the winners of the 28th annual Vancouver Magazine Restaurant Awards and thank the magazine itself for their continued support and recognition of Vancouver’s flourishing culinary scene.